September | 2015 | ohdenny. 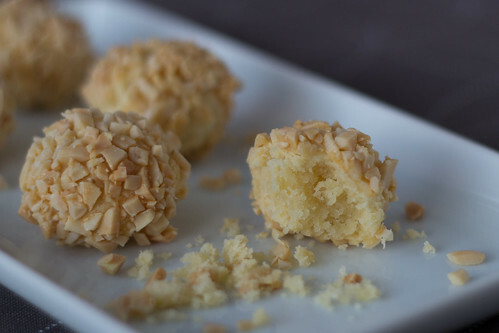 Adapted from the recipe book, In Love with Cookies by Alan Ooi, these cheesy cookies are moist straight from the oven. 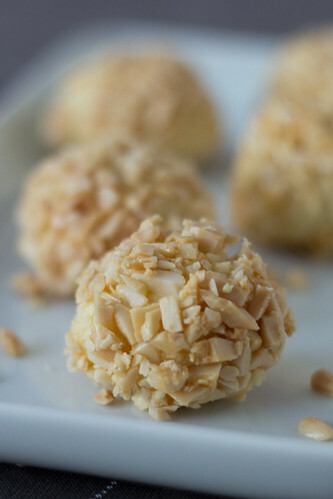 With a lovely almond flavour and crunch. 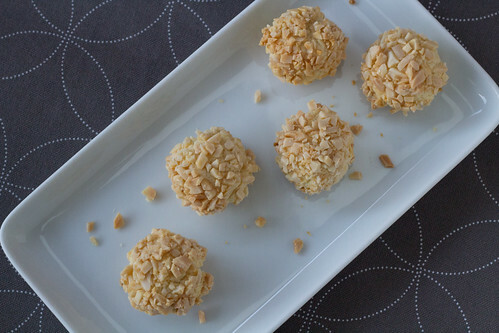 Easy to make and a great afternoon tea snack. 1. Preheat oven to 165°C. 2. 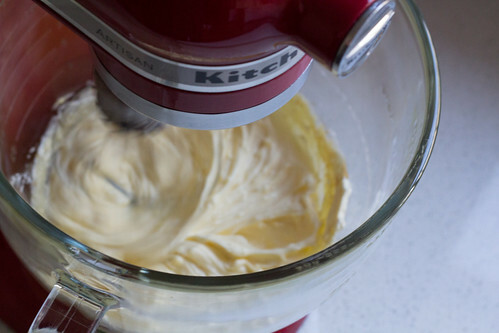 Blend the butter, cream cheese, sifted icing sugar, vanilla essence and salt until well combined. 3. 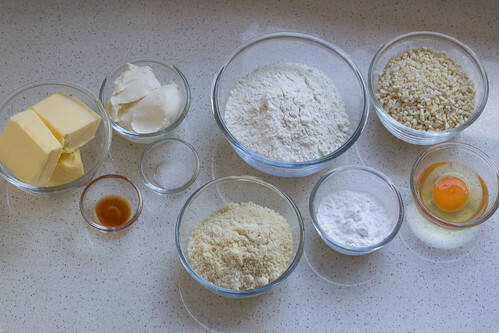 Add in the sifted plain flour, and ground almond to the mixture until it is mixed well. 4. 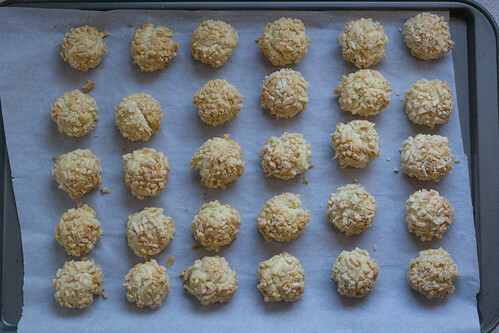 Divided the dough into 7g each and form into balls. Coat with the egg and then dip into the chopped almond to coat all around. 5. Bake in the oven for 20 to 25 minutes, or until slightly browned. Cheesy, moist, almonutty cookies. Best eaten fresh from the oven. 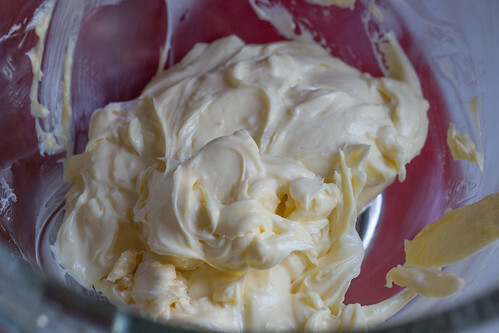 Blend the butter, cream cheese, sifted icing sugar, vanilla essence and salt until well combined. 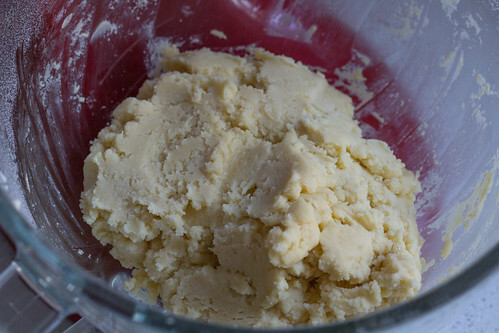 Add in the sifted plain flour, and ground almond to the mixture until it is mixed well. 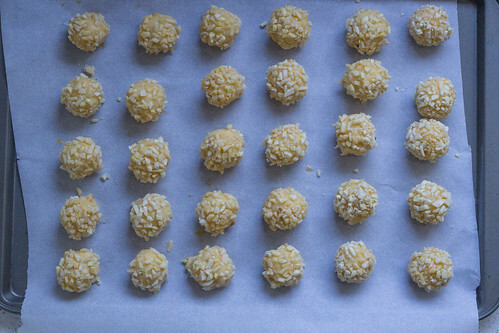 Divided the dough into 7g each and form into balls. Coat with the egg and then dip into the chopped almond to coat all around. Bake in the oven for 20 to 25 minutes, or until slightly browned. Madam Kwan’s recently opened its doors in Box Hill, replacing Straits of Malacca which seemed to vanish as soon as it opened. 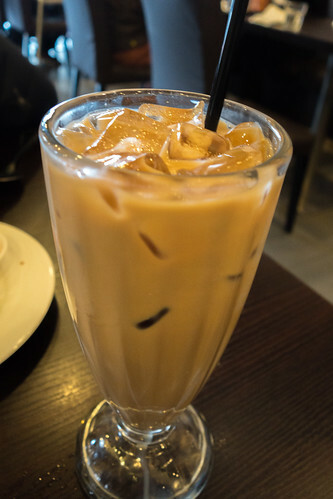 Also, not to be confused by Madam Kwong’s and Kwan’s Dim Sum on Whitehorse Road. It retains the same name as a franchise in Malaysia. 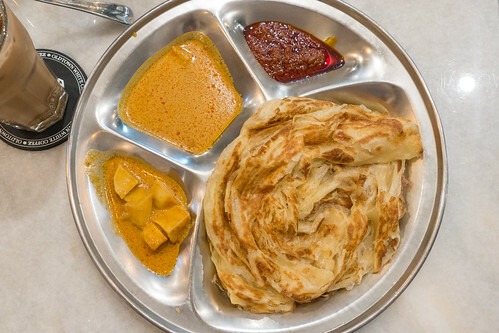 Variety-wise, it’s quite similar to PappaRich with a mix of noodle and rice dishes, drinks and desserts (Durian too) although where it falls short is the number of menu options, like Nasi Kandar, Roti Canai but seem to mark its place with a few of their specialties such as Madam Kwan’s Noodle Soup. 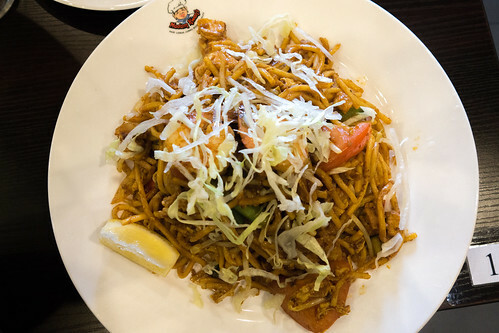 Madam Kwan’s Mee Goreng, is probably one of the better ones I’ve tried although it lacks that slight sweet and sourness from the tomato sauce that is frequently used in Mee Goreng. Apart from that, I found it quite filling (portions are generous). 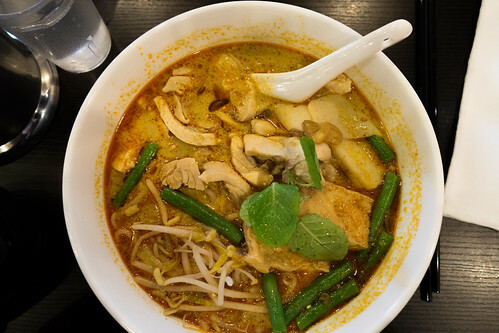 The Chicken Curry Laksa isn’t like what you’d find in Chef Lagenda or Laksa King where it has this rich, creaminess to the Laksa. Instead, it opts for the fragrance of the spices used to add depth to the soup base. 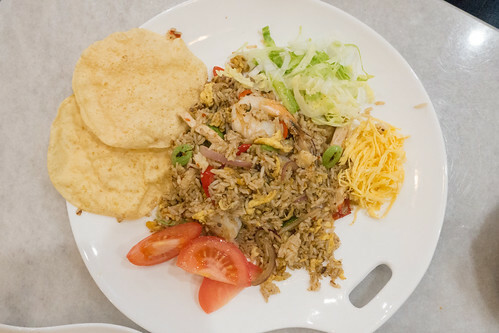 Again, it’s a generous offering with both egg and rice vermicelli noodles. 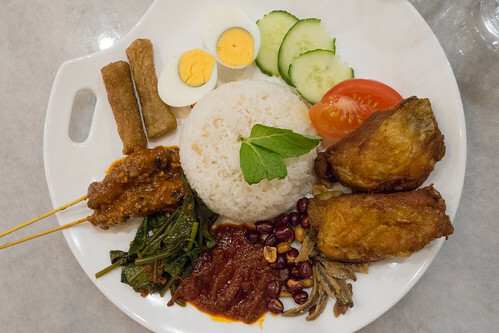 Madam Kwan’s Lobak is one of my favourites I’ve tried in Melbourne and can actually best some of the ones I’ve tried in Malaysia. It has this wonderful balance of pork and the seasoning. Plus, it adds yam/taro that adds texture and fragrance that I didn’t even know I wanted in a Lobak, and yet it works so well together. Yum. Be warned though, their side dishes cost nearly as much as their mains. 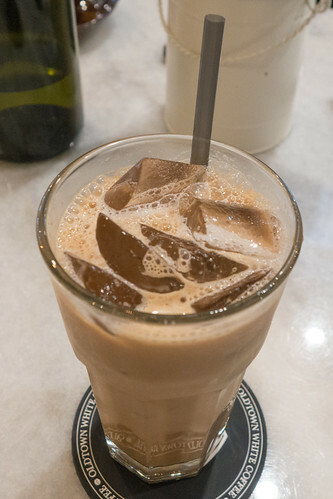 I found their Teh Tarik on the other hand to be overly sweet from its excessive use of condensed milk. Tea flavour-wise it’s on the stronger side of things so the balance is a bit off in my books. 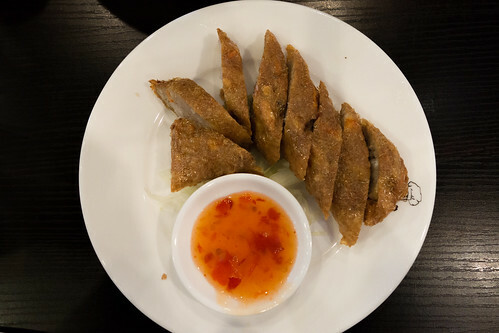 While I would say, Madam Kwan’s isn’t my favourite Malaysian eatery in Melbourne, it’s probably one of the tastier choices for Malaysian cuisine in the Box Hill and even Doncaster/Blackburn area. Having been up and down Whitehorse Road nearly everyday for a few years now, I’m still finding new places to try. 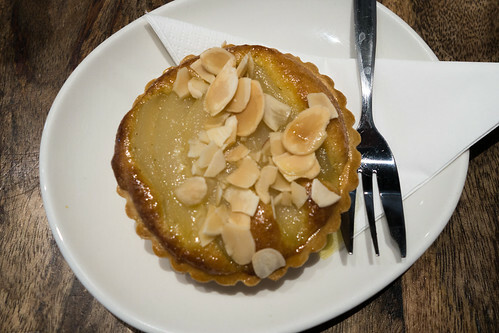 Scarvelli Cafe is one of the many cafes on this long stretch of road but is located further down from the main hub in Balwyn. 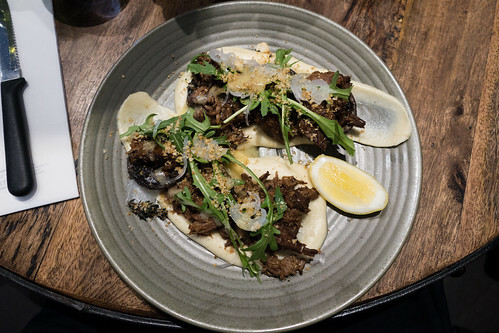 Scarvelli prides itself on the Paddock to Plate philosophy, sourcing fresh, seasonal produce from the owner’s farm on the Bellarine Peninsula at Swan Bay for their dishes. 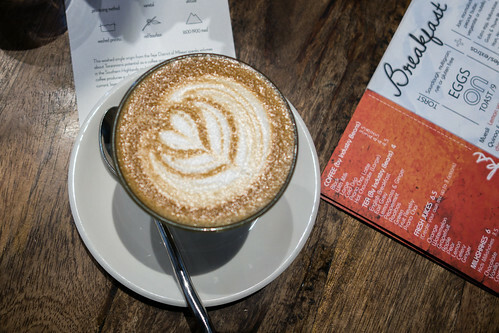 This exciting concept, combined with Industry Beans coffee makes for a very appealing visit to Scarvelli. 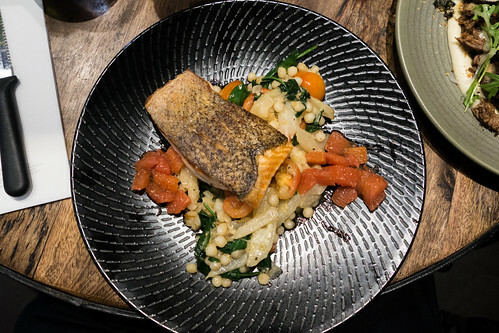 Their Tassie Salmon with cous cous, tomatoes and grapefruit makes for a very tasty meal. The salmon is cooked well, and the acidity from the grapefruit adds this beautiful freshness to the entire dish. The crispy salmon skin is also a winner. Probably the highlight for me was Scarvelli’s Braised Swan Bay Beef. The slow braised beef cheek has this amazing, bold beef flavour to it. The mushrooms, again, fragrant and complements the beef with the creamy parsnip puree. 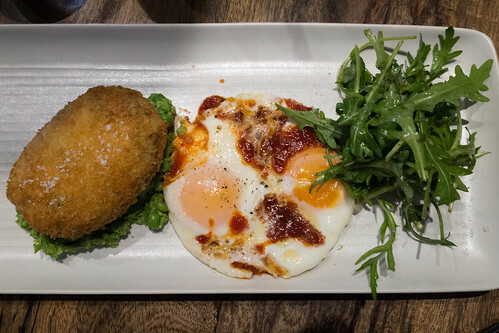 The Chilli Eggs and Ham is an interesting breakfast dish with a crumbed potato, sauerkraut and ham croquette and smashed peas. 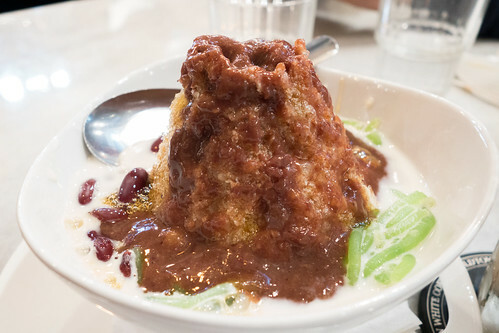 The chilli dressing reminds me of a chilli jam with some sweetness to it. The peas lacked a bit of flavour too. I do applaud them for keeping their menu varied though. The braised beef dish along with their strong, Tanzanian coffee makes for a very delicious trip down to Balwyn. It’s also quite a popular breakfast, brunch spot so please do keep that in mind if wanting to make a visit there. I will definitely make plans to try their other dishes and of course, order another coffee to go with it.